The third sophomore in Pac-10 history to win player of the year. The others were Jason Kidd (1994) and Mike Bibby (1998). Harden is also the third ASU player to win it following Ike Diogu (2005) and Eddie House (2000). Thomas set the freshman scoring record for Washington with 477 points and is the fourth Husky to win the award. This is the second time Romar has won the award, previously he was named coach of the year in 2005. He may come back for another year, thanks in part to his good friend O.J Mayo’s advice. The regular season Pac-10 champions, Washington, find themselves in the drivers seat for the tournament. They are the favorites riding a five-game winning streak into the tournament. The Huskies fates will depend heavy on Pac-10 Freshman of the Year Isaiah Thomas. He is the best pure scorer and can create his own shot. Mr. Double-Double, Jon Brockman, will also need to play big for the Huskies to pull one out. Do not be surprised if they need a basket late in a game and the ball ends up in senior Justin Dentmon’s hands. 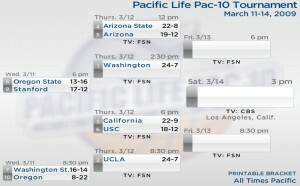 Contenders: UCLA and Arizona State. 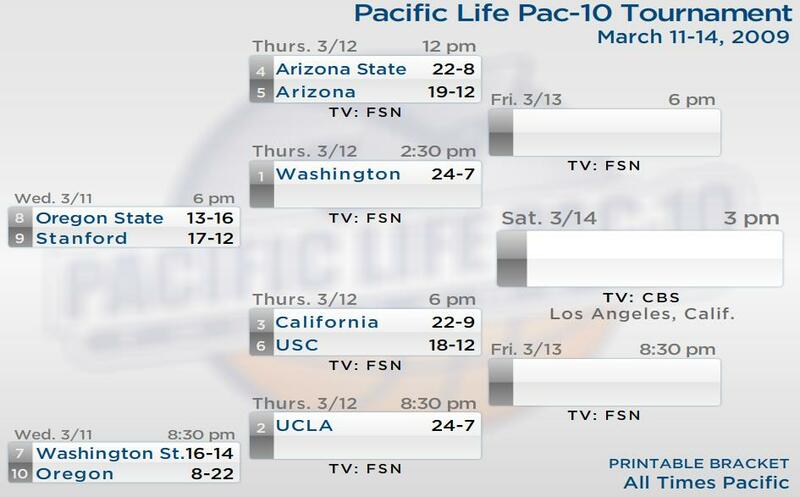 This is the first year in Darren Collison’s career that UCLA did not garner the number one seed for the tournament. The Bruins are still a huge threat as the number two seed. They have a great coach who has a knack for getting his team to play better when it matters. The tournament is also right in their backyard, The Staples Center. Arizona State is always a threat with Player of the Year James Harden patrolling the court. They stumbled toward the finish with three losses in their final four games. The Sun Devils played up-and-down ball all year, so who knows what to expect in the tournament, they could lose their first game against Arizona or win the whole tournament. The dark horse in all this is seven-seed Washington State. The Cougars have won three of their last four, the only loss at Washington. They won at UCLA and beat Arizona and ASU at home. They are playing their best ball at the end of the year and will be a tough matchup for UCLA should they get past Oregon in the first round. The Bruins and Cougars split the season series with both teams losing at home. The first game was a two-point loss for the Cougars. They had a chance at the buzzer to win, but a 3-point attempt by Marcus Capers was off target. The second game was a loss for UCLA. It was only their second loss at home all year. In a high scoring game Taylor Rochestie led the Cougars to only their second victory in LA in their last 53 games. Josh Shipp had a buzzer-beater blocked. Both games went down to the buzzer and don’t expect anything less than this one. This entry was posted on Monday, March 9th, 2009 at 10:33 pm by nvr1983	and is filed under 2009 conference tournaments. Tagged: alfred aboya, arizona, arizona state, california, chase budinger, conference tournaments, daniel hackett, darren collison, deangelo casto, demar derozan, eddie house, ike diogu, isaiah thomas, james harden, jason kidd, jeff pendergraph, jeremy green, jerome randle, jon brockman, jordan hill, josh shipp, jrue holiday, justin dentmon, klay thompson, lorenzo romar, marcus capers, mike bibby, nic wise, oj mayo, oregon, oregon state, pac-10, patrick christopher, stanford, taj gibson, taylor rochestie, ucla, usc, washington, washington state. You can follow any responses to this entry through the RSS 2.0 feed. You can leave a response, or trackback from your own site.